When it comes to securing your property, CCTV cameras can be very effective. However, because there are a wide variety of CCTV cameras suited for different applications, if they are not properly implemented, their effectiveness may be compromised. Before choosing your surveillance system, review the different types of CCTV cameras and the application for which they are best suited. Choosing the right CCTV camera for your property is important. You want to evaluate your needs to determine where you will place these cameras as well as their primary use in that location. Some factors to consider when choosing include the lens, sensor, and output resolution. The lens will dictate the quality of the image. The appropriate lens will allow your camera to focus and bring in enough light to the sensor, providing clarity and the ability to better identify things such as faces and license plates. A zoom lens will allow for further detail since it can adjust the light as it reaches to sensor for enhanced pictures and flexibility. CCD are more expensive than CMOS and produce clearer images (ideal for identifying faces and license plates). Generally speaking, the more pixels, the better the picture. The highest resolution you can get is 700TL, but most cameras range between 300-550TVL. Be sure to match a resolution that your camera can produce because anything more is unnecessary. Box cameras are easier to be seen and clearly tell passersby that they are being recorded, which acts as a great deterrent. Dome cameras, on the other hand, are smaller and more discreet, making them ideal for monitoring larger areas such as front or backyards. Consider where you will place your cameras both indoors and outdoors. If you plan on placing them outdoors, you want to ensure they are in the best location and well protected (weatherproof and vandal proof housing). For indoor cameras, you want to make sure it will not be affected by things like grease or steam from the kitchen. Whether indoors or outdoors, lighting will always change so it is advised that you test different camera models to see what works best with your lighting conditions. You also want to check for any reflections or backlighting during day or night. This will depend on the size of the area you want to monitor. Thus, a camera situated in a small room need not be of high resolution. The resolution of your CCTV camera should reflect the landscape in order to provide effective images. This depends on your personal preference (you should also look into the laws regarding audio recording if applicable). Some CCTV systems allow you to speak to the intruders, or you can have audio or alarms sound automatically when they reach a certain point. These tactics are meant to scare the intruders away before they can cause damage. If you need help choosing the right CCTV surveillance system, call 888-203-6294 and we will be happy to help! You may also browse our selection online at SecurityCamExpert.com and connect with us on Facebook, Google+, Twitter, LinkedIn, and Pinterest. Shopping for security camera systems may seem like a one-size-fits-all deal, but, unfortunately, it is not. Because there are a plethora of security camera types and surveillance features to be considered, it will take some time to decide. Evaluate your security needs, do some research and weigh your options. To make it easier, we will break down the different types, housing, and common features of security cameras. The following are the advantages and disadvantages of common security camera types. Fixed – As the name suggests, fixed cameras are positioned to capture an image and are always pointing in the intended direction. Because these do no move, they are more reliable than PTZ cameras and can be optimized with different housing and features. PTZ Cameras– PTZ stands for Pan, Tilt, and Zoom, thus, these cameras can be remotely positioned (thanks to specially designed motors and gears). These cameras may be set to automatically patrol an area, but they seem to be most effective when manually controlled. For zoom capabilities, 32X is fairly common, although some higher end cameras may have a greater zoom range. While a greater zoom range is helpful when covering a large area, it is not always necessary. However, there are some downfalls. Because PTZ cameras can adjust its viewing range, there are chances that they may miss something. Also, zoom decreases the size of the area being covered, and the camera can only be facing one direction at a time. 360-Degree Cameras – Also known as virtual PTZ, the 360-degree camera utilizes several high resolution fixed cameras in a single housing (usually dome). The images are then stitched together and can be zoomed in on after recording (zoom capabilities depend on the cameras being used). Because this type of camera can face in all directions, it can be an effective forensic tool. Unfortunately, these cameras are often oversold as a universal solution, despite the fact that very few rooms allow for an unobstructed view in all directions. In applications where this camera is necessary, it often does wonderfully. However, a standard fixed camera can be paired with a lens to give it a 120-degree to 140-degree view. Also, many rooms are better monitored with cameras in corners (which only require a 90-degree field of view). Once you have chosen the camera type, housing will come into play. Outdoor – Because of changing environmental elements, outdoor camera housing will be more weather resistant and include heaters and blowers. Dome – These are designed to obscure the direction of the camera to outsiders. This is often the best deterrent, making it a high priority and often a default selection. Most people assume dome cameras cover the entire area, making a fixed dome camera covering a door entrance more effective. Bullet – These are named for their sleek, cylindrical shape, often times resembling a bullet. This housing clearly shows the direction of the lens and generally provides a better picture. The front of the housing is close to the camera lens, decreasing reflections and making it easier to maintain. These act as deterrents as well, but are not as effective as ambiguous housing. Discreet – These completely disguise the camera as something else, such as a smoke detector or motion sensor, or as nothing at all, with pinhole or flush mount lenses installed in a wall or ceiling. Because they are hidden, they are not designed to be deterrents. These are often favored by architects looking to achieve a certain aesthetic. All types of housing can be made to be vandal resistant, which is a step up from weather resistant. These types of housings are most commonly dome shaped and are designed to withstand unfriendly environments while still providing a usable image. The selection of features for your security cameras will depend on the application and your individual needs. Resolution – Resolution is measured in megapixels (millions of pixels) and is a major factor in picture and video quality. The higher the resolution, the more space required to store the images and processing power to manipulate it. To demonstrate the differences in resolution, an old analog camera is about ¼ megapixel, an HDTV screen is just over 2 megapixels, and the highest resolution projected image in movie theaters (4K) is 8.8 megapixels. While higher resolution cameras may be appealing, these do not respond as well as lower resolution cameras in low light situations. Thus, it is possible to buy more resolution than you need, unnecessarily increasing storage costs while decreasing performance. Low Light – Cameras with day/night capabilities are able to automatically adjust modes in various lighting situations. With advanced technologies, these cameras are able to produce usable images in near total darkness. There are also cameras with infrared illuminators, which provide their own light source to obtain better images in low light settings. As mentioned, in order to improve low light performance, you will need to sacrifice some resolution. Lens Features – Varifocal lenses allow the installer to manually adjust the image magnification when installing the camera. However, many fixed cameras now come with remote zoom and focus (allowing the user to adjust the camera without physically going to the camera site), as well as auto-focus. Advanced Options – Other options to consider include wireless signal transition, ultra-high resolution, thermal imaging, explosion proof housings and more. No matter what the application, there’s likely a perfect security solution thanks to the comprehensive options available. And while the selection process may seem overwhelming, we are here to help. Feel free to browse our CCTV surveillance systems online at SecurityCamExpert.com or call 888-203-6294 to speak with a representative. You can also connect with us on Facebook, Google+, Twitter, LinkedIn and Pinterest! Security camera systems have made great advances over the years. From traditional analog CCTV technology to IP networking, security camera quality and features have improved to provide better monitoring and security. Some of these enhanced benefits include higher resolutions resulting in clearer images, fewer cameras covering larger areas, and thus, a lower total cost of ownership. Many businesses and homeowners are opting to trade up to network IP security cameras, network video recorders (NVRs) and cloud-based storage for more convenient and affordable security. Aside from protecting homes and company headquarters, assisted living communities can also reap the benefits of installing network IP security cameras. In the way that security cameras deter burglars from targeting your property, in assisted living facilities, the aim is to deter abuse and neglect. By strategically placing these cameras in and around the facility, family members can put their worries at ease by reviewing stored footage to ensure that no mistreatment is taking place and that the staff is providing the proper care. For facility managers, video surveillance footage can provide evidence should an employee or resident be charged with abusive behavior. Network IP cameras can also help the staff keep a closer eye on residents or patients. For those residents at risk for falls, staff can potentially prevent falls and injuries, or respond faster to those incidents. Medical equipment such as oxygen tubes may get dislodged, and staff can get to the rooms faster to fix the problems. In the case of memory units, the entrances and exits can be closely monitored to prevent residents from wandering outside of supervised areas, and can help protect the facility from possible intruders. These security cameras can also prevent employee theft. Although we would rather think that this is uncommon, it is not unheard of for residents to report their belongings stolen. Whether these claims are accurate or not, cameras provide evidence to prove what really happened. Also, facilities often find that supplies may go missing. To counter these losses, IP cameras can document the incident or prevent it from occurring in the first place. Of course, opponents of these security measures stand firm in their belief that it makes it more difficult to recruit staff and that employees will have trouble making sound decisions for fear of families challenging their actions. The problem with this stance is that numerous other careers and industries are under constant surveillance with little to no issues arising. Proponents of employee surveillance believe these measures will help workers to make better decisions and avoid any questionable situations. Why Should You Upgrade To IP Security Cameras? As stated, upgrading to IP security cameras comes with a myriad of enhanced benefits. Aside from the obvious video quality improvement, IP cameras are able to utilize your existing CAT5 or CAT6 Ethernet cabling, saving time and money on installation. The intelligent video features include facial recognition, motion detection, audio detection and people-counting, to name a few. Also, because they are connected to the Internet, owners are able to remotely view live video, search archived footage, and receive alerts via any PC, tablet, or smart phone. Because the various IP camera choices on the market, it can be a bit overwhelming. Here are some important features you should know about before choosing the best IP cameras for your needs. There are three design options for IP cameras: bullet, dome and PTZ (Pan, Tilt, Zoom). As inferred by their name, bullet cameras resemble a bullet shaped and best suited for directional monitoring. They typically do not possess the capability to zoom in or move. Dome cameras are shaped like domes and ambiguously monitor areas, aiding in its role of deterring misconduct. “Speed domes” spin quickly to capture a broader range of images. Lastly, PTZ cameras are ideal for covering large areas. These cameras can move and capture different angles, thus, delivering the work of several fixed-point cameras in one single device. PTZ surveillance cameras may also be preprogrammed to scan an area or may be controlled remotely. IP camera resolution is the amount of visual data that can be captured and is measured in megapixels. It is often provided in horizontal and vertical pixel dimensions (ex. A camera that has 1280 x 1024 resolution is 1.3MP because 1280 x 1024 = 1,310,720 or 1.3MP). A higher resolution means the camera can capture more data, resulting in improved video clarity. This allows you to transmit power over the data cable, which can run up to 100 feet. This will save you money and decrease installation limitations. In addition, the PoE standard 802.3af supports higher power ratings needed for motorized cameras (ex. PTZ). If you are monitoring an area that has challenging lighting conditions, you will want a camera that has good wide dynamic range (WDR). This will control the backlight and remove shadows to produce adequate footage in difficult environments. Infrared (IR) LED lighting is like night vision, allowing cameras to capture clear footage in low to no light conditions. IP cameras can see infrared light and when wavelengths reflect back, it is as if the room is illuminated and the camera can record video. Night vision capabilities improve with more IRLEDs and longer ranges. If you are using your surveillance cameras outdoors, be sure to choose weatherproof and “vandal resistant” cameras, which will often be IP66 rated and IK10 rated respectively. This will safeguard against water or dirt, which can interfere with your recordings or damage your equipment. Some cameras even offer thermostatic controls, which will help to prevent condensation forming over the lens. When upgrading to IP cameras within your home, business, or in assisted living communities, be sure to evaluate your needs and review your options before making a final decision. If you need assistance, please feel free to call us at 888-203-6294 to speak with a representative and request a free quote. You may also visit SecurityCamExpert.com to browse our inventory of network IP cameras and surveillance equipment. Connect with us on Facebook, Google+, Twitter, LinkedIn, and Pinterest for the latest news and updates! How Much Do Home Security Surveillance Cameras Cost? Shopping on a budget for a security camera system? It doesn’t have to be that hard. Let SecurityCamExpert.com help you find smart solutions without breaking the bank. Our selection of security cameras includes a variety of different styles with varying specifications. We carry security cameras starting as low as $20-$60 and reaching up to $250-$400 depending on specifications. You can pay for better quality and features, or you can get good quality for a decent price. It all depends on how much you can or are willing to spend. For the most basic security system solutions, you can opt for dummy cameras. Our dummy cameras don’t exceed $30 so you can build a pseudo security system for cheap. Check out this SecurityMan Dummy Indoor Camera, it has a convincing look for a reasonable price. If you want a functioning security system, dome security cameras and bullet security cameras are common types and low in price. Ours range from $40-$175, all dependent upon picture resolution, special features like night vision or audio components. Still, a great camera can be found for a cost-effective price. Our box cameras hover around the same range, but also require a separate purchase of camera lenses, which can add to overall cost. As we move up the price ladder, our specialty security cameras like HD-SDI, high resolution, network IP and PTZ (pan/tilt/zoom) start around $100 and go up from there. It should be understood that you are paying more for performance and abilities. These cameras offer much better picture and allow you to better manipulate your viewing range. License plate capture cameras have magnificent zoom abilities along with solid resolution, so they can start north of $200. While SecurityCamExpert.com offers individual security cameras, we also offer great packaged deals which can significantly assist those on a tight budget. Our camera packages include the basics: DVR (with & without hard drives), cameras, cables and power supplies. Our 4 camera packages range from $249 up to $549, while our 8 camera packages range from $329 up to $567. Our 16 camera packages range from $836-915, but we also offer wireless camera bundles that start as low as $139 and up. Our 4 camera IP/hybrid camera package starts at $399 and you can add more cameras or accessories from there. You can explore our packages options here. Shop our inventory online and you’ll find security cameras or systems that fit within your budget. Would you rather get a quote based on your needs? Fill out our Free CCTV System Quote and work with our staff to create a security system within your means. Feel free to call us at 1-888-203-6294 with any questions you may have. Do Dummy Cameras Actually Work? Ever wonder why people use dummy cameras or fake security cameras? Do you think “If they’re going to spend money on dummy cameras, why not buy real ones?” There are varying opinions on fake security cameras. 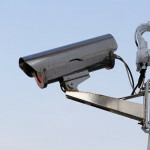 Some find dummy security cameras pointless, while others find that their dummy cameras deter crimes for a cheaper price. Some people believe that since the dummy cameras don’t work, it is useless to purchase and install them. 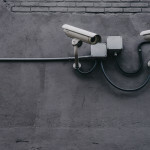 It is reasonable to believe that, and to each his own, however, studies have shown that the presence of security cameras can help to prevent crimes. For those who desire some type of security but can only afford so much, dummy security cameras could be a great alternative. While employing a real security camera will allow you to actually monitor what is going on in and around your property, the mere presence can do a sufficient job. The trick is to purchase a convincing fake security camera. The right dummy cameras won’t blatantly look like fake security cameras. Most dummy cameras are made to look fairly realistic, but some cameras possess dead giveaways. It is best to steer clear of these dummy security cameras. The key to choosing the right dummy security cameras is to know what a real security camera looks like. You want the dummy security cameras to be seen, but you don’t want it to be too obvious. You want people to think you’re trying to be covert, as you would with a real security camera. Most security cameras are built to be somewhat elusive, and placement can help with that. Installing dummy cameras in traditional surveillance camera spots will make them more convincing. Ambiguity can elicit apprehension, which is why fake security cameras can be a wise investment. As long as you are well-informed about your choice and installation of fake security cameras, dummy security cameras may actually work for you. While they don’t capture criminal acts, they can avert possible criminals. Shop our selection of dummy cameras online at SecurityCamExpert.com or give us a call at 1-888-203-6294. Dome security cameras have been in demand lately. This spike in sales and usage is most likely due to its compact design and cost-effective prices. But just because these cameras are affordable does not mean they skimp in the features department. You can find dome cameras equipped with fantastic features for a reasonable price. PTZ (Pan, tilt, zoom) capabilities are common in dome cameras. This allows a single dome camera to reach a wide viewing range, possibly eliminating the need for multiple cameras in a given area. The zooming abilities can zero in on specific details which can be significant in identifying a culprit. The inconspicuousness of the dome camera is often cited as a selling point. Truth is, nowadays, you know a dome camera when you see it. The tinted dome covering is a more optimal feature of the dome camera. While the actual camera is easy to spot, it is nearly impossible to tell which direction the lens is pointed. Furthermore, some dome cameras employ a tracking component, so a person could not suspect the camera is tracking his or her movements. Due to varying light in different settings, dome cameras usually have infrared, low light or day/night vision to produce better pictures throughout the day and night. The IR irradiation distance depends on the camera so paying close attention to specifications is important. Most dome cameras are vandal proof, adding built in security to your camera investment. If the environment permits, you may be able to install your dome camera out of reach to minimize the possibility of vandalism. However, in some areas, it is inevitable to place the dome camera on a wall or a low ceiling. The vandal proof, tinted dome then comes into play, protecting your camera from any possible damage or destruction from powerful blows. Often referred to as the “eye in the sky,” dome cameras offer functionality in an appealing package. If you have any questions regarding dome cameras, please call us at 1-888-203-6294 and our staff will gladly assist you. You may also visit us at SecurityCamExpert.com to browse our inventory of dome cameras and more. 4 Channel DVR Package with 4 Dome Security Cameras – On Sale Now! In need of a surveillance system but don’t know where to start? 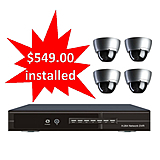 Here at SecurityCamExpert.com, you’ll find all the components you need for your surveillance system, from 4 channel DVRs to up to 32 channel DVRs, as well as various types of security cameras. Even better, we have CCTV system packages which include the essentials to get you started. Our SCE 4 Channel Package with 4 cameras is perfect for smaller businesses or home use. This package includes a 4 channel DVR, 4 dome security cameras, a 250GB hard drive, a 5Amp power supply, 4 30ft. premade cables and a 4 split pigtail. The SCE DVR-7004 EH.264 4 Channel Real-Time CIF DVR will work together with the 250GB hard drive to store all the data and footage you capture. Of many special features, this 4 channel DVR has digital zoom, which may be manipulated in both preview and playback. Mobile monitoring is also enabled, supported by iPhone, Windows Mobile, BlackBerry, Symbian and Android. This package provides flexible monitoring options allowing you a sense of security. There are 4 600TVL CMOS dome security cameras included in this package (2 plastic and 2 vandal proof). While placement is under your discretion, these plastic and vandal proof options allow you to utilize your dome security cameras indoors and outdoors, should you choose too. The Plastic CMOS dome cameras possess 600TV Lines and 3.6mm board lenses. The Vandal Proof CMOS dome cameras have 600TV Lines and a 50ft. range. All 4 cameras are similar which will provide consistent quality monitoring for your business or property. The 5Amp power supply, premade cables and 4 split pigtail will help you connect and power your security cameras and 4 channel DVR. The 4 premade cables should only be run along exterior walls while not exceeding 33ft (10m). 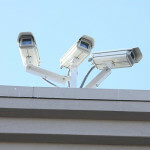 SecurityCamExpert.com will cover installation so long as it is within a 25 mile radius of Pomona, CA 91767. We also include a 6 month warranty and a brief 15 minute training session with this package. Network configurations, however, are not included; we will provide you with all the port numbers and application names that are compatible. For a complete, affordable package including dome security cameras, a 4 channel DVR and compatible parts and accessories, choose our SCE 4 Channel Package with 4 cameras. We also carry 8 camera and 16 camera packages. To learn more about this package, or any other packages, call us at 1-888-203-6294 or visit SecurityCamExpert.com to browse the selection.